Fig. 1: Hartley oscillator powered by a peltier element. The aim for increasingly lower supply voltages is especially noticeable in the field of PC-technology. In the early days a voltage of 5 volt were the norm, nowadays runs everything at 3,3 V and the CPU-core on even lower voltages. And there are the mobile devices that are satisfied with the voltage of a single penlight or coin cell. The picture on the right shows a hartley oscillator that already works with a voltage of 10 mV. Here is a peltier element used as a power source. A slight touch with a finger is enough to get the oscillator running. A circuits that has to work on very low voltages can make very good use of the benefits a Junction-FET. In contrast to bipolar transistors these components don't suffer of the PN-junction voltage which is circa 500 to 600 mV at low currents. In a junction-FET a drain current flows already at a gate-source voltage of 0 volt. At a low drain-source voltage Vds follows the drain current this voltage in a proportional way as shown in figure 2. That a drain current is flowing is point a, the second condition is that the gain is sufficient at low voltages. Figure 3 shows that the gain is dependent of the drain-source voltage. The gain is expressed drain current change per gate-source voltage change: G = ΔId / ΔVgs. Of the four types J-FET's who where available for this test appears the BF245A to have the most beneficial properties. This type has the lowest stationary current and also the highest gain. There are most likely J-FET types who have even better properties, but they weren't available at the moment the test took place. Fig. 4: Extreme low voltage hartley oscillator. 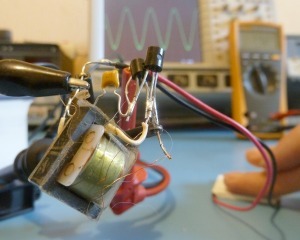 A Hartley type oscillator is chosen for this extreme low-voltage design. This type of oscillator has a direct DC-coupling between the gate and source by the winding N1 of the transformer. Hereby the DC-setting Vgs = 0 V of the J-FET is realized. To let the oscillator function at 10 millivolt the gain of a single J-FET appears not to be enough. By putting two J-FET's in parallel the gain became more sufficient. The oscillation frequency is approximately 20 kHz and it outputs a voltage of circa 1,2 V. At 10 mV the circuit draws a current of 70 µA. The energy the oscillator delivers is extremely small. The load of a measurement instrument can already be too much. The test is done with an oscilloscope with an 1:10 probe that has an ohmic resistance of 10 MΩ and a capacity of 12 pF. The turn ratio of the transformer ensures that the gate gets a high enough drive voltage to let the oscillator function. The transformer is made with an Amidon EA-77-188 core. N1 has 900 turns Ø0,1 mm enamelled copper wire. N2 has 4 turns of brass strip with a thickness of 50 µm and a width equal to the bobbin height.